The mission of Leadership Tulsa is to identify, develop, and connect diverse leaders who impact the community through service. 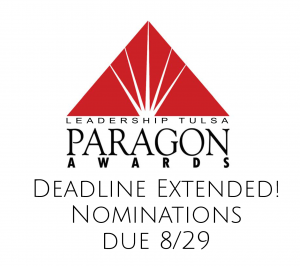 The Paragon Awards were designed to recognize exceptional contributions by Leadership Tulsa members serving our community. Last year, we updated the Paragon Awards to grow our ability to recognize and reward a wider variety of Leadership Tulsa members who impact the community through service. We are pleased to present 7 focused categories for nominations. Nominations are due August 29. Nominations can be made by organizations, Leadership Tulsa members, or any individual in the community. Winners will be recognized at our Paragon Awards event the evening of November 15, 2018. Presented based on impact and to a specific non-profit agency in the Tulsa metro region or for a history of service to many nonprofit agencies. To check the eligibility of a candidate, contact kendall@leadershiptulsa.org or call her at 918-477-7079. Winners from the previous three years may not be re-nominated, see below. All other past nominees are eligible. Nominations are due no later than 5 p.m. Friday, August 24. Nominations can be made by organizations, Leadership Tulsa members, or any individual in the community. All nominations are confidential. Winners will be announced once they are contacted and agree to accept the awards. Winners will be recognized at our Paragon Awards event the evening of November 15, 2018.